Just one of many Italian rip-offs following in the wake of The Exorcist, The Omen and Rosemary’s Baby, this tardy effort from occasional director Liberatore is at least enlivened by an off-kilter, almost throwaway, attitude to plot development, some nasty moments and a mildly original – and effective – final act. Set in the rather grubby, down-at-heel Venice of Giallo a Venezia, rather than the glamarous city seen in films such as Don’t Look Now, the plot follows blind teenager Mark and his far-from-affectionate sister Christine, orphan siblings in the care of a strict and religious aunt. Christine’s boyfriend Giorgio wants her to move in, but there is no room at his sculptor’s studio for Mark, and no money to support them. When the aunt is burned to death in an accident inadvertantly caused by Mark, they are sent to relatives operating a run-down hotel, who receive them with a lack of enthusiasm. Encouraging Christine’s efforts to make the hotel viable again, her uncle begins to warm to the children, but the death of his sickly wife leads him to suicide in the attic and the children are left to fend for themselves. 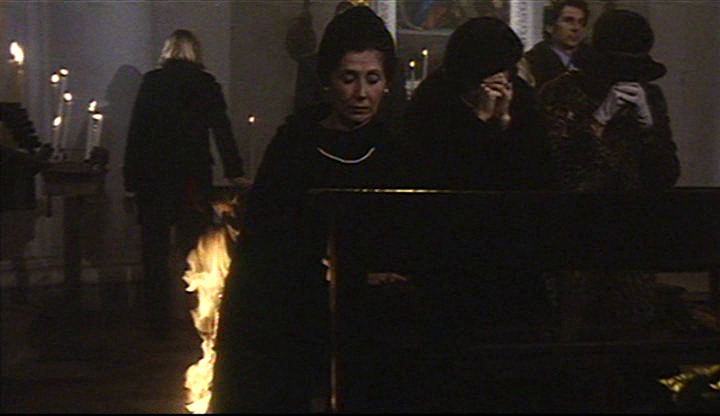 The local priest takes a keen and slightly sinister interest in Christine, especially when a mysterious guest seduces her and she finds herself pregnant. Mark suffers from a series of visions which suggest that his sister is the focus of a Satanic cult. It seems that only Mark and Giorgio are aware of – and can stop – a sinister plot to engineer Satan’s reincarnation on Earth. Though this is a film which contains rather too much plot for ninety minutes, what first appears as slapdash editing – with many scenes ending just as crucial lines of dialogue are delivered – contributes to a sense of psychological disorientation. With Mark as a protagonist, what first appears as a straightforward retread of The Omen, becomes something more perverse, complex and effective as his status as unreliable narrator is revealed. The revalation that Christine has turned the hotel into a brothel is thrown away in a single line of a phone conversation – though, in retrospect, a plot point which may suggest Christine’s increasing corruption may have been subtlely downplayed to suggest Mark’s paranoia. Christine’s boyfriend Giorgio moves from co-conspirator in the plot against Alex, the new-born spawn of Satan, to helpless witness, chronicling the events in a diary he christens the “Gospel of Alex”. Mark’s final act is both shocking and, ultimately, futile as his true part in the plot is revealed. There are some mis-steps which mar the film. Pino Donaggio’s score is lush and broad in scope, but the soundtrack is marred by some hideously cack-handed ‘zingers’, usually emphasising Mark’s blindness, as he stumbles into a succession of doors, windows and other characters. The decision to name the Satan character “Dan” leads to a few unintentional giggles too, with the power of the final reveal somewhat lessened by the prospect of mankind at the mercy of the “Son of Dan”. Renato Cestie’s performance is a little uneven too, with an occasionally whiny, unsympathetic portrayal which unbalances the film. The refusal to fully exploit the beauty of Venice’s waterways can only be assumed to be intentional given that the film is otherwise handsomely shot – with several interior scenes displaying impressive use of lighting. The candlelit birthday party for Alex, featuring the women of the brothel dancing together wearing a succession of masks is particularly affecting. The film doesn’t shy away from the sleaze common to Italian genre pictures of the period, with Niehaus in particular spending much of the film is various states of undress. The violence is occasionally very explicit too, but is used sparingly for maximum effect – which is certainly the case in the final scenes. A better, more honest effort, to reply to Hollywood’s blockbuster ‘devil’ movies then. And one which has an Italian character all its own. « Ok, bear with me….